It's been a while since I last attended a vintage fair and I was determined to make sure that I made an effort for The Clerkenwell Vintage Fashion Fair, which is one of my favourites. The theme for this particular event was Winter Wonderland and although I didn't exactly feel festive in my Horrockses dress and pink 1980s does 50s shoes, as soon as I walked in I knew. I've been trying to save money recently and only make purchases when necessary but this proved very difficult as there was simply so much to see. First of all I met Alexandra from Alexandra Vintage and purchased a pair of red gloves, before noticing a book on St Michael and the History of Marks and Spencers. For me, this was like hitting the jackpot. I am actually an employee of the company in a retail capacity so it was a great opportunity to read up on the background! Since it only cost £5 I wasn't too worried about spending too much, until I walked into the next room and spotted small shoes! As anyone who knows me will say, I have very small feet that aren't suitable for the big bulky shoes found on the modern day High Street and this seemed like a great investment. First of all I tried on a pair of gorgeous boudoir slippers, which looked like actual shoes. I'd caught the attention of the trader by this time and she began to suggest some items from her collection. I particularly liked a pair of white shoes but they were ever so slightly too narrow. I was thinking of moving on to the next stall by this time and then I saw them. 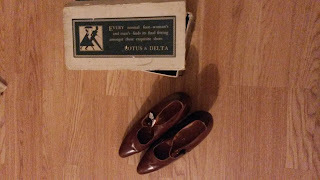 A pair of stunning chestnut 1920s shoes with a thin strap and popper clasp. It took about five minutes to get the poppers to snap open and I tentatively stepped into them. The thrill of knowing that they fit instantly was overwhelming and I couldn't help but try a few moves from The Charleston in them. The trader then explained that the shoes had come from the attic of a former shoe shop on Bond Street and the owner had locked them there when he retired. He'd kept all the original boxes so naturally the shoes could be bought with the original box. 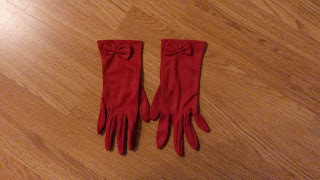 There was no question by now-I simply had to have them. Luckily I have a very generous Dad who bought them for me as I couldn't quite afford them on my own and I wandered off with them in a bag. I couldn't resist showing them off! I decided recently that instead of indulging in any more dresses or skirts I would concentrate on vintage accessories and as a result have been buying a lot to compensate for the lack of new dresses! These have included a 1950s Jane Shilton handbag, some gorgeous 1950s peach gloves with pearl beading and a couple of scarves and brooches. So, with this in mind I made my way around the stalls, looking around hopefully for 1950s sweaters or jumpers. They were few and far between, but fortunately I can always rely on the lovely Ginny at Retrouve to provide some of the very best in vintage. Ginny is particularly selective of her stock, she even has a superb woollen Sambo dress which is just slightly too big for me, but I hope it finds an owner soon! 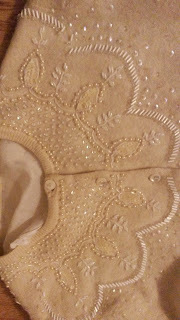 She had a lovely array of items, including three gorgeous 1950s sweaters! 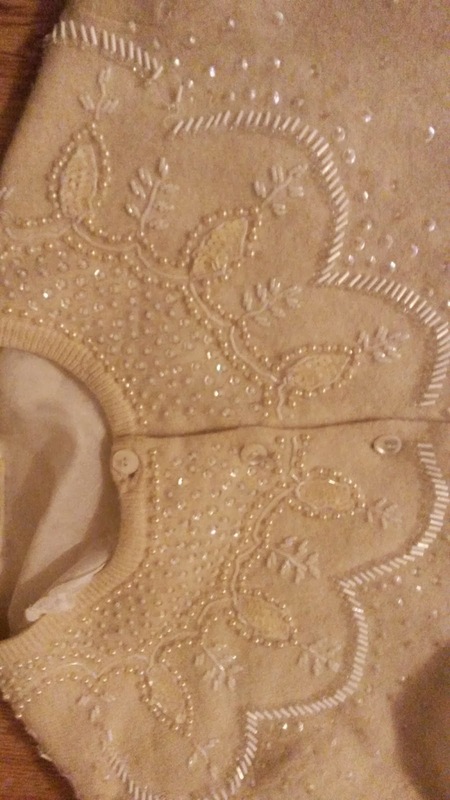 I tried on a pretty floral jumper and a beaded cardigan before settling on the cardigan sweater, which is exactly what I've been looking for! Not bad for Vintage on a budget!